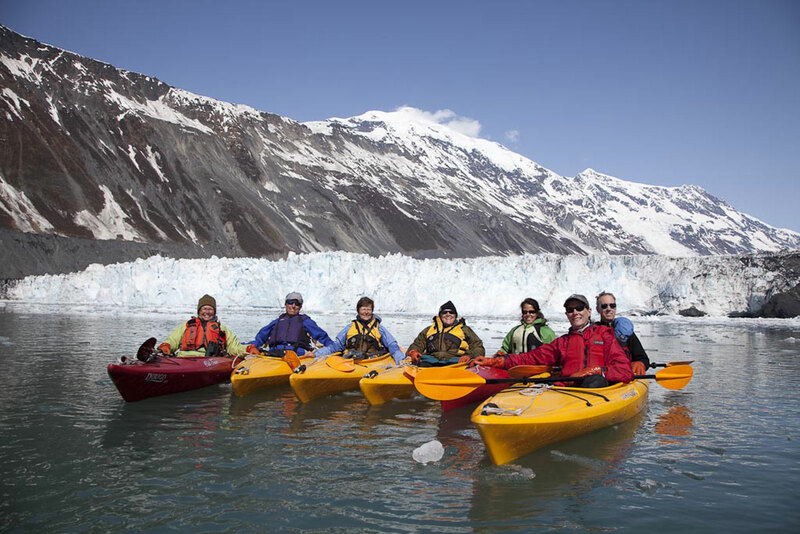 Explore a slice of Alaska – Arctic Plains, Brooks Range, Denali, and Lake Clark National Parks, and cruise Prince William Sound. Experience the wildlife and scenery traversing these beautiful National Parks. Moose, grizzly bear, caribou, muskoxen, gray wolf, Arctic fox, and birds from king eiders to bald eagles await you in this rugged frontier land. Journey south from the wide-open tundra of the Arctic Coastal Plains through the Brooks Range and across the Arctic Circle. Visit Denali National Park for wildlife and wildflowers and take an exhilarating scenic flight around the highest mountain in North America. Explore the remote corners of Prince William Sound on a five-day voyage, observing sea otters, harbor seals, whales, puffins, and loons, amidst a spectacular blend of mountain, forest, and glacial scenery. Take home countless memories and photographs under the expert guidance of Alaska resident and naturalist, Bill Mohrwinkel. • Search for Alaska’s iconic wildlife including moose, grizzly bear, caribou, muskoxen, gray wolf, and Arctic fox. 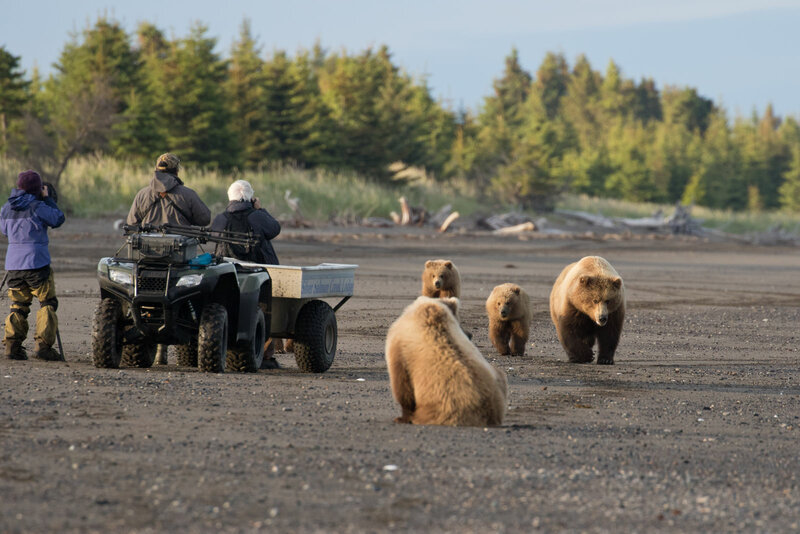 • Observe coastal brown bears at Silver Salmon Creek Lodge, a private reserve within Lake Clark National Park. • Explore varied scenery from muskoxen on the tundra to playful sea otters in Prince William Sound. Jun 7 Arrive in Anchorage, Alaska. 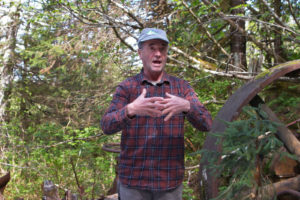 Living and guiding in Alaska for 25 years, Bill has vast knowledge to share. He was part owner of an Arctic tour business for 10 years and has guided sea kayaking trips in Prince William Sound, polar and brown bear trips, and birding trips. 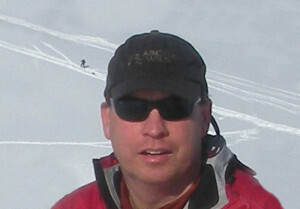 His love of the polar regions has led bill to also guide in Antarctica and South Georgia Island. Though he is not a photographer, he has extensive experience guiding photo trips and works hard to help clients accomplish their goals for the tour. His true passion is natural history and sharing that passion with participants, and he loves to have fun! Dean will assist during days aboard the Discovery only. 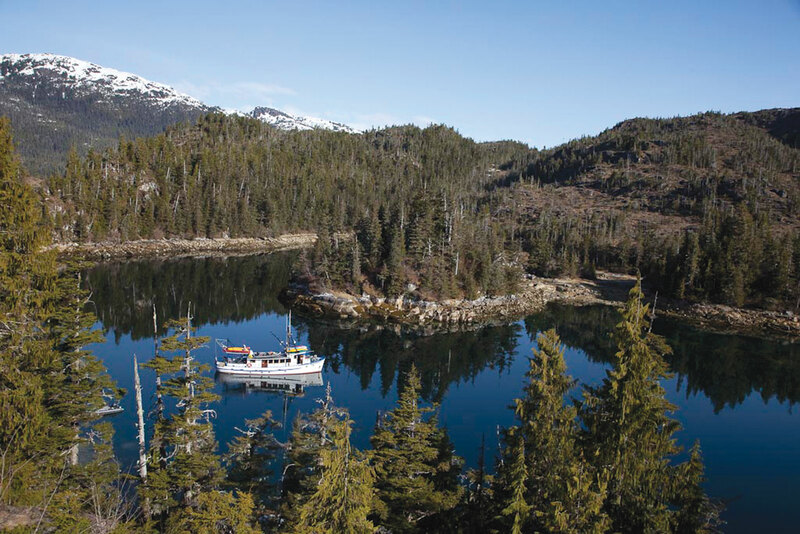 Considered by many to be one of the most knowledgeable mariners in Prince William Sound, Dean's extensive involvement with a broad range of scientific research conducted throughout the sound has provided him with a well-rounded background in the region's natural history. 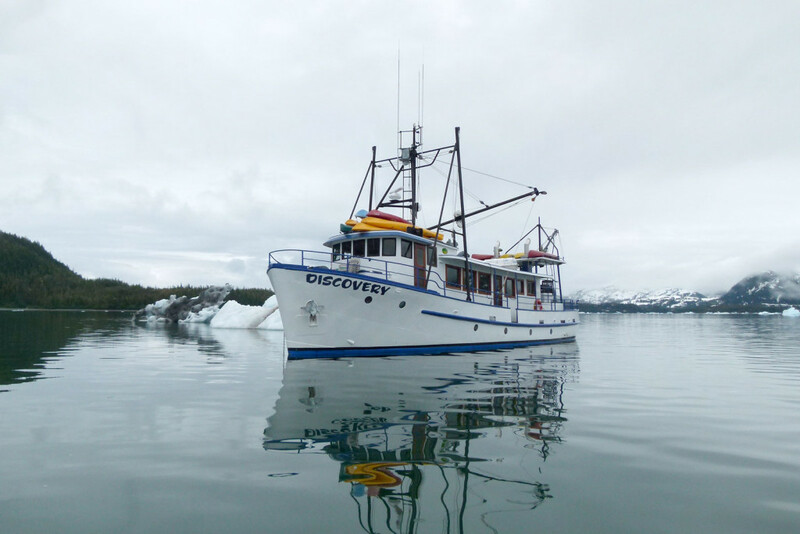 Longtime owner and Captain of the Discovery, Dean is a master shipwright and marine mechanic with more than 40 years of full-time service in the marine trades on the Alaska coast. Arrive in Anchorage, Alaska. Lodging on this night is not included but we’ll be happy to make arrangements for you. Take the afternoon flight from Anchorage to Deadhorse Airport at Prudhoe Bay. The industrial complex of Deadhorse (consisting of the airport, lodging, and general store) supports the oil industry on the North Slope along the Arctic Ocean. Bill will meet you at the airport upon arrival to begin this amazing Alaskan adventure in what appears, at first glance, an unlikely place to view wildlife. 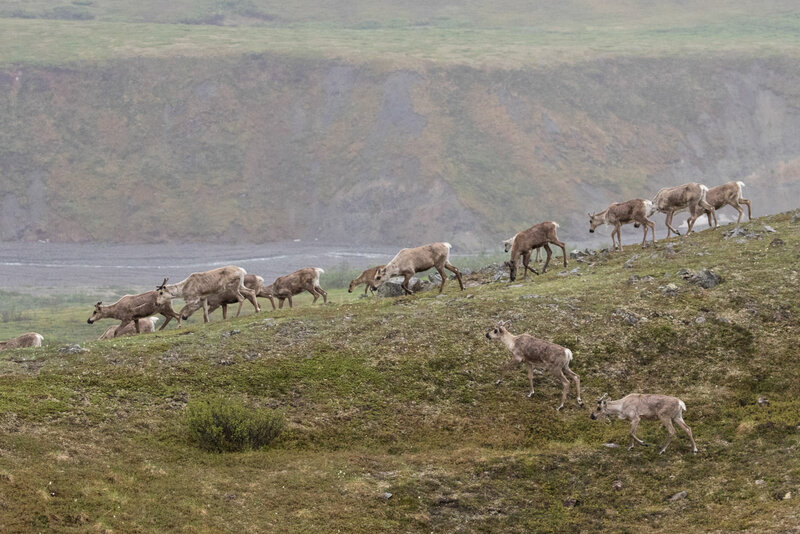 Muskoxen, caribou, gray wolf, Arctic fox, and many spectacular birds make the Arctic Coastal Plain their home during the brief summer season. The oil industry’s presence results in residual heat creating freshwater pools that would otherwise be frozen. These pools are an excellent place for you to spot opportunistic shorebirds and other unusual birds like spectacled and king eiders. You may want to stay out late to photograph in the soft light of the Midnight Sun. 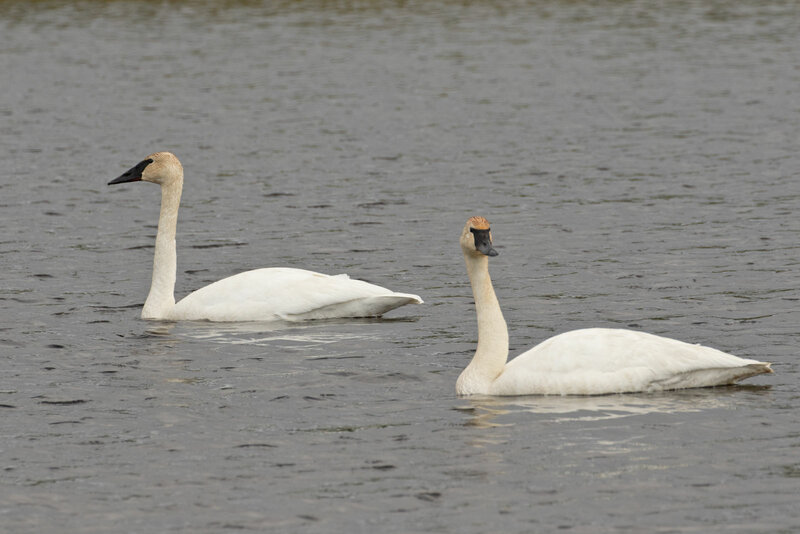 You’ll spend the day searching for birds and mammals on the Arctic Coastal Plain. Pacific, common, and red-throated loons, all in breeding plumage, are regularly seen. King and spectacled eiders, all three species of jaeger, Arctic warbler, and about 130 other species can be found in this birding paradise. Arctic fox and the native red fox are also common visitors. A short drive down the Dalton Highway (which follows the Alaska Pipeline) may afford looks at muskoxen, grizzly bear, caribou, and gray wolf. You’ll drive the scenic Dalton Highway across the Arctic Coastal Plain and through the Brooks Range searching for wildlife and other photographic opportunities en route to Wiseman. Animals come to the plain to partake of the brief, but intense bloom of life and its brilliant carpet of tundra vegetation is an excellent backdrop for photos. Caribou, moose, and muskoxen are often seen browsing on willows and sedges, while predators, such as wolves, fox, snowy owl, and gyrfalcon search for a warm meal. You’ll ascend the foothills of the Brooks Range and over the Atigun Pass at 5,000 feet, the highest mountain pass in Alaska that is maintained year-round. Pass through the Koyukuk Valley with craggy peaks of 400-million-year-old limestone. You’ll have time to search for grizzly bear, moose, and lynx in the dense spruce forest. At the end of the day, you’ll arrive in Wiseman, a historic gold-mining community, that is well worth the time to explore on foot. Many artifacts can be found within a short walk of the lodge. Depending on weather and pilot availability, you may have the option of a scenic flight over the Brooks Range and the wilderness of the Arctic National Park. Cost not included, but Bill will organize it. You’ll continue south traversing boreal forest and mountain passes of windswept tundra. As you cross the Arctic Circle, you’ll stop for a photo and picnic lunch then continue looking for wildlife in the changing habitats. Further south, you cross the mighty Yukon River and continue through the White Mountains to Fairbanks. Spend your free day in Fairbanks experiencing world-class museums (UAF Museum of the North, Fountainhead Antique Auto Museum, and Pioneer Park), the Morris Thompson Cultural and Visitors Center to learn about the cultural and natural history of Interior Alaska, the UAF Large Animal Research Station for close-up views of muskoxen, caribou and reindeer, the Creamer’s Field Migratory Waterfowl Refuge to photograph sandhill cranes, waterfowl, and songbirds, walk aboard a vintage stern-wheeler at Pioneer Park, or shop for native art work housed in a 1939 hand-built log cabin at The Alaska House! We will help you plan and facilitate your day in Fairbanks! Drive to Denali National Park and enjoy the Denali Visitor Center located at the northeast end of the park before heading to EarthSong Lodge. If timing and availability work out, get a tour of the working dog kennels and a wonderful slide show presentation from the lodge owner, Jon Nierenburg, an excellent photographer and dogsledder. 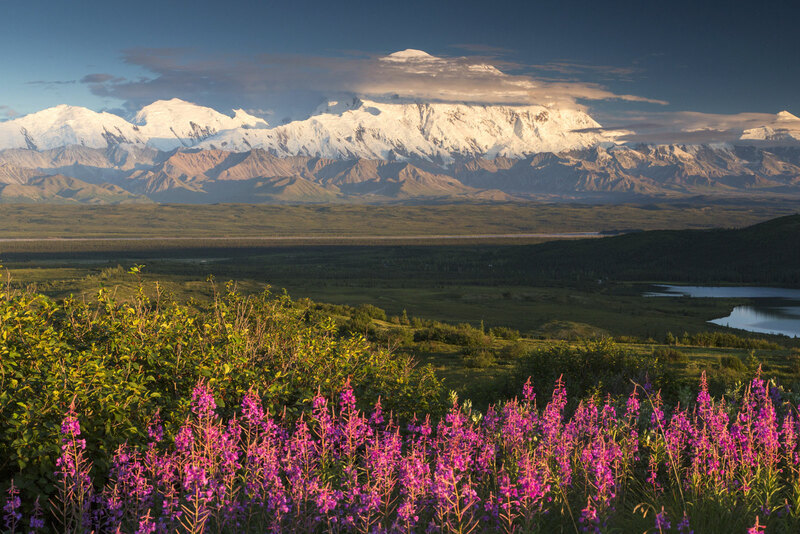 Denali National Park exemplifies Interior Alaska’s character as one of the world’s last great frontiers. Most of the park remains largely wild and unspoiled. It’s an excellent place for viewing wildlife and wildflowers, mammals, and birds. Stony Creek is one of the special areas to explore with 132 species of wildflowers, as well as wheatears, nesting shorebirds, long-tailed jaeger, and other birds. Depending on the weather, you’ll have the opportunity for a scenic flight around Denali’s impressive peak (cost included). The mountain makes its own weather and is often hidden in clouds, especially in the afternoon. Staying two nights in Kantishna provides excellent opportunities to photograph this majestic mountain and explore the Kantishna side of the park, including Wonder Lake for iconic photos of Denali’s reflection. You’ll depart early for what will hopefully be more stunning views of Denali and great wildlife experiences traversing back through the park. You’ll travel south to Anchorage through fertile Matanuska Valley farmlands and make a stop at Denali State Park for a chance to photograph the south side of the Alaska Range and Denali from a distance. After checking in the hotel, you’ll have a bit of time to explore downtown Anchorage and enjoy dinner on your own this evening. You’ll travel to the small port town of Whittier on the western side of Prince William Sound to rendezvous with the Discovery and begin your five-day voyage through breathtaking glacial scenery, blue icebergs, and spectacular marine life. Lush vegetation drapes the hillsides in green as streaming waterfalls cascade down the rocky cliffs. Harbor seals hauled out on the flotillas of icebergs and bald eagles perched atop trees watch as the Discovery navigates the icy, blue waters. You’ll search for marine mammals such as sea otters, often seen sunbathing on icebergs or carrying young on their bellies as they swim. Listen to the cracks, pops, and thunderous roars of calving glaciers while the Discovery drifts silently by these active rivers of ice. Prince William Sound is surrounded by the northern-most temperate rainforest in the world and many land mammals are also present, though not always easy to spot. You’ll hike on shore among the wildflowers and also kayak for a water-level view of the wonders of the sound. Whale watching will be another exciting and unpredictable experience as many whales, especially humpbacks, are found in the region. You will wake to some of the world’s most spectacular scenery with sprawling glaciers and a panoramic skyline of mountain grandeur. After disembarking, you’ll follow the Turnagain Arm of the Cook Inlet to return to Anchorage. Be sure to keep an eye out for the occasional family of Dall sheep on the cliffs above. From Anchorage, you’ll take a one-hour flight to Silver Salmon Creek Lodge, situated on the coast of Cook Inlet within Lake Clark National Park. The scenic, low-level flight will end with a beach or lagoon landing for a unique experience. Silver Salmon Creek Lodge is on 40 acres of private land within the coastal region of the expansive park, offering views of the coast and towering volcanic peaks. 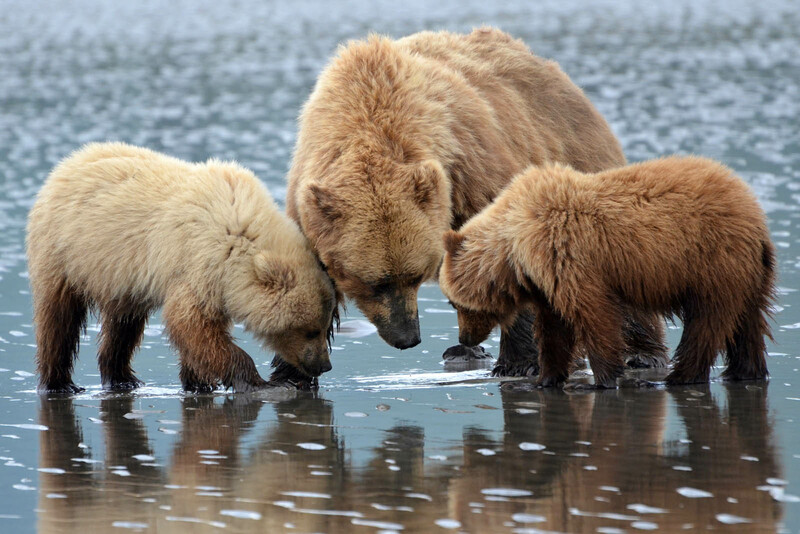 The opportunity to observe concentrations of coastal brown bears in their natural habitat is the primary attraction of this remote wilderness area. Due to their high-protein salmon diet, coastal brown bears are often significantly larger than the interior grizzly bears (both are subspecies of brown bear, Ursus arctos). Most of the time spent here will be observing and photographing the phenomenal bear activity, sometimes even from the deck of your cabin. You’ll look for mothers with cubs as well as larger male bears as they dig for clams at low tide and forage for grass in the meadows. 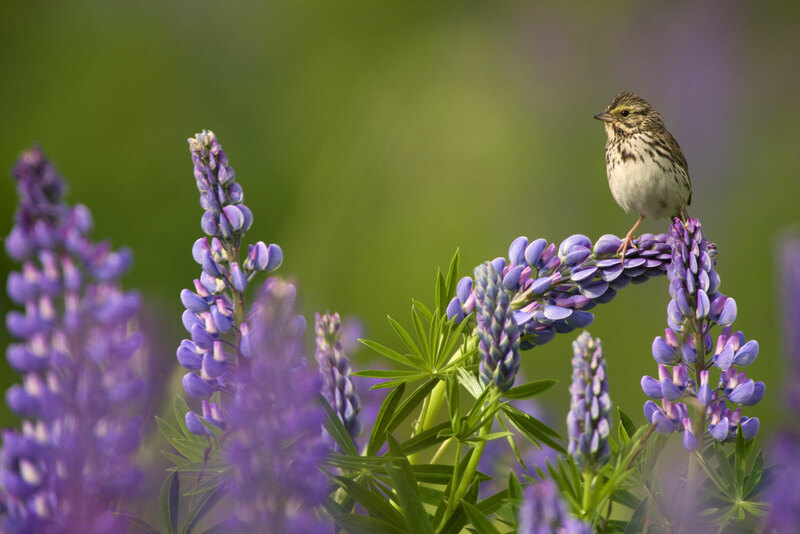 Patches of lupine, wild geranium, and other wildflowers will add a splash of color to your photos. As you move into the habitat of the bear, you may witness seldom-seen behaviors, such as courting, mating, and nursing. Keep your eye out for wolves and other wildlife that inhabit the park as well. Birding around Silver Salmon Creek Lodge is excellent with an abundance of shorebirds, songbirds, and birds of prey, such as peregrine falcons and northern harriers. Small islands just off the coast host nesting pelagic birds. Horned and tufted puffins, parakeet auklets, murres, eiders, and more are found here during the short Alaskan summer. If time and weather permits, you will make a half day boat voyage to “Bird Island,” a major nesting ground for horned and tufted puffins and common murres with excellent photography opportunities. You will have the morning for one last bear viewing opportunity and to take in the wildlife and scenery around Silver Salmon Creek before departing for the flight back to Anchorage. Tonight, you’ll enjoy a farewell dinner together at a local restaurant. 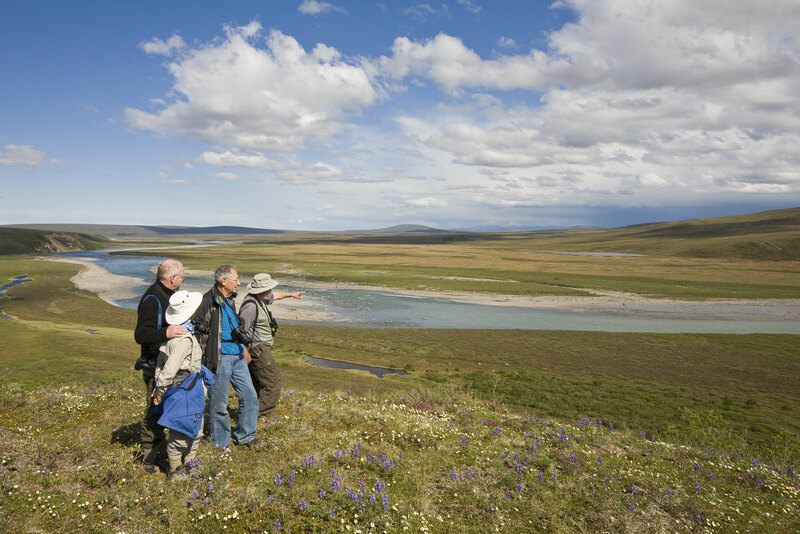 Explore a slice of Alaska – Arctic Plains, Brooks Range, Denali, and Lake Clark National Parks. The Discovery is meticulously fitted to combine comfort and utility with an atmosphere of charm and style. The lower deck includes sleeping accommodations for up to twelve guests in six cabins, plus crew quarters, two bathrooms with hot showers, and stowage space. Guests can readily view and photograph panoramic scenery and marine life from the ship's complete walk-around deck and expansive windows. Unlike the cumbersome cruise ship giants, the Discovery's size enables access to Alaska's lesser-traveled, more intimate inside passages. Costs are per person, double occupancy, not including airfare (except round-trip flights between Anchorage and Silver Salmon Creek Lodge and the scenic flight in Denali National Park, weather permitting), singles extra. See Included and Not Included sections for more details. We reserve the right to charge for cost increases that occur between when we set tour prices and the date of travel, for example, changes due to the cost of lodging and transportation. If you are a single traveler and you are willing to have a roommate, we will find a roommate for you, and if we cannot, we will not charge you a single supplement fee. Single rooms are subject to availability and cannot be guaranteed throughout the safari. All activities, leaders, transport, park entry and user fees, landing fees and permits unless described as optional. Accommodations for the nights of June 8 through June 26. Meals from dinner on June 8 through breakfast on June 27 except meals listed in the Not Included section. Round-trip flights between Anchorage and Silver Salmon Creek Lodge. Rubber boots at Silver Salmon Creek Lodge. Scenic flight in Denali National Park (weather permitting; no portion of the tour cost is refunded if the flight must be cancelled). Group airport transfer on June 8 in Prudhoe Bay. Complimentary beverages (wine, beer, spirits, sodas, juice) aboard the Discovery and in Wiseman. Rubber boots, rain gear, and kayaks available for use aboard the Discovery. Gratuities to lodge and hotel staff throughout the trip except at Silver Salmon Creek Lodge. All Airfare (except flights listed as included), airport and departure taxes, and excess baggage fees. Optional scenic flight in Wiseman (approximately $300, depending on length, paid at time of flight, and subject to weather conditions and availability). Lodging in Anchorage prior to flight to Prudhoe Bay. Lunch on June 13 and dinners on June 12, 13, 17, and 22. Gratuities for the crew of the Discovery: tipping is, of course, discretionary, however we suggest budgeting a total of $200–$260 per participant to be distributed among the three Discovery crewmembers (including Bill). Gratuities for the guide and staff at Silver Salmon Creek Lodge: tipping is, of course, discretionary. It is customary to tip about $60–$70 per participant for our guide and about $50–$60 per participant to be split among the lodge staff. Gratuities for the scenic flight pilots. We recommend $10–$15 per participant per flight. Additional night(s) and meals in Anchorage or Silver Salmon Creek Lodge if weather delays the flight. Items of a personal nature such as laundry, telephone calls, medical costs or hospitalization, room service, alcoholic and other beverages (except on the Discovery), items not on the regular menu, etc. If you have special dietary needs, please indicate them on your Reservation/Release Form. We cover a lot of territory so expect a wide range of temperatures, weather, and wind conditions. Daytime temperatures usually range from 30–70°F (up to the 80’s°F in the south) with nights possibly below freezing in the high Arctic. Both rain and snow are possible as are warm, sunny days. We strive for frequent stops for wildlife viewing, however participants should be comfortable sitting for several hours at a time due to the distances we cover. Our voyage in Prince William Sound will include landings and opportunities to hike on shore, typically no more than a mile or two on varying terrain. Walks and hikes are generally at a slow pace with stops for observation and photography and may be skipped by anyone that is not interested or able. Kayaking is also an option. You must be able to climb up and down a steep, narrow staircase on the boat. At Silver Salmon Creek Lodge, you may walk over a mile each day on flat terrain at a slow pace. Please contact us if you have any health concerns that may make this trip challenging. Airfare (except flights listed as included) is not included in trip costs. Detailed flight information and the contact information for our recommended flight-ticketing agent are included in the Trip Materials we will send you after registration. Flights you (or a travel agent) book: Arrive in Anchorage, Alaska (ANC) by June 7, then fly to Prudhoe Bay (SCC) on the afternoon of June 8. Everyone should book the same afternoon Alaska Air flight from ANC to SCC that departs ANC between 2:00pm and 3:00pm on June 8; we will provide specifics in our Trip Materials. Alaska Air has, on occasion, cancelled this afternoon flight and moved people to the morning flight, so it is important to arrive in Anchorage on June 7 for an overnight (not included) to be sure you get to Prudhoe Bay the next day. Depart from Anchorage anytime on June 27. Flights we book for you: The round-trip flights between Anchorage and Silver Salmon Creek Lodge in Lake Clark National Park. The cost of this round-trip booking is included in the tour cost. Lodging throughout the safari is very comfortable albeit basic at times. 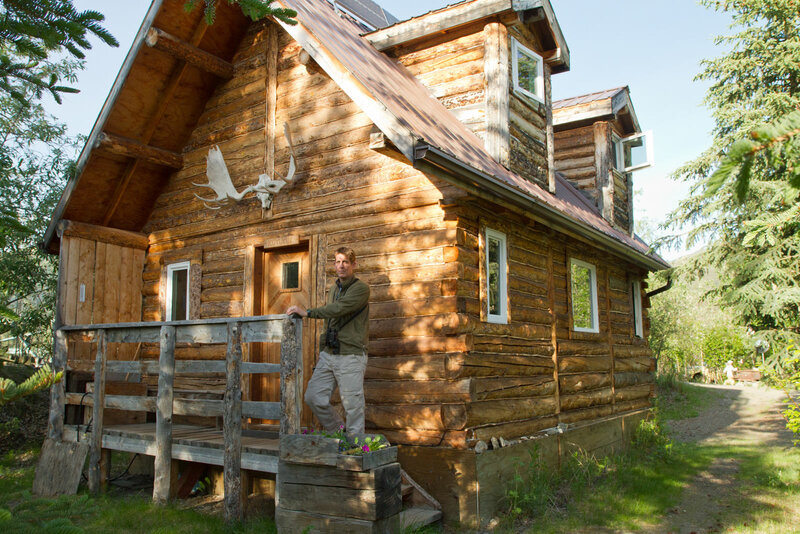 Since we travel to remote locations, we do not have many options, but we have found excellent choices in all locations and will enjoy the rustic Alaskan feel and remoteness of our lodges. Most lodges have private baths, however some have shared baths and Skyline Lodge in Kantishna has shared bathrooms in a separate building a short walk from our rooms (staying here is well worth it since we can travel in our own van through Denali Park, avoiding the 50-passenger shuttle buses that all other visitors must take to reach Kantishna). Each of the Discovery cabins has bunk beds, a small clothing closet, and drawers for your personal belongings; the two shared bathrooms provide complete facilities including a hot shower. See our website for more details about the Discovery, including photos. Travel in our private, custom-designed 12-seater Mercedes Sprinter, specifically adapted for photography, including windows that open on both sides. With only seven participants throughout the journey, you’ll have plenty of room for photography. Spend five days and four nights aboard the cozy and comfortable, twelve-passenger Discovery. Additional Discovery guests may join our group for just this Prince William Sound portion of our safari. Take a scenic round-trip flight in a small aircraft between Anchorage and Silver Salmon Creek Lodge. We will have additional opportunities for scenic flights in small aircraft while in the Brooks Range and around Mount Denali (depending on weather). "The BEST!!!!! The BEST adventure travel company in the world. This happened to be my thirteenth (or maybe fourteenth?) Cheesemans' trip, so I should know. Incredible attention to every detail. Fabulous leaders." "No other company will give you more time in the field to see and photograph wildlife than Cheesemans'." "What a treasure! And so wonderful to travel with a company that cares as much about the place and their clients as Cheesemans' obviously does. Makes a complete package."